Got Lorna and ME Draculaura! Such a good deal! No Haunted though, I've yet to see them except the budgets :/ Going to try and go really early to see if they restocked..
Monster Discussion / Re: What was the last MH thing you bought! part deux! Sightings / Re: Upcoming sales and Price Matching! No, you can't, because that was a mistake in their system and was never advertised. Monster Discussion / Re: Anyone not like the Freaky Fusion dolls? I don't have any of the fused girls, but I do have Avea, Bonita, and FF Ghoulia and Scarah. I love my two Hybrid girls, exceptional dolls. I would only get a fused doll if they were on a super sale..like under 8 bucks lol. Off Topic / Re: What non-MH purchase did you recently make? Checked Walmart in hopes they put out new dolls... Nope. I picked up a lone GNO Spectra though for $5. That's strange how Scaris Frankie didn't have it. I really don't know the deal with the toy department/scanning. Some people got Ghoul Sports, Ghoul Spirit, FCA, etc for $5 and mine only had Scaris and 13 Wishes reduced. I talked to a really cool employee in the toy dept. He said he didn't know about Haunted coming up for $5. He then went on to say that those employees are lazy and that he'd mark a few MH down to $2 because they're cool. His girlfriend likes them too. I did the same thing this morning, galaxy. Checked all the Walmarts again, but nothing new Really disappointing, but I'm still glad that I at least got one doll I didn't have previously, which was Elissabat. Still holding out for more deals to come this month! Just got back going to my 4 closest Wal-Marts, and no Haunted. I even shamelessly dug through the pallets, but nope. Still haven't seen then, not even at TRU but I did get Scaris Skelita, 13w Gigi, Scaris Rochelle, Honey, Viperine, and Elissabat so I really should not be complaining. Thinking hard about that Cleolei, what a deal omg. You guys are too awesome, thanks for the heads up! Just ordered the 5 pack from Target, can't wait!! 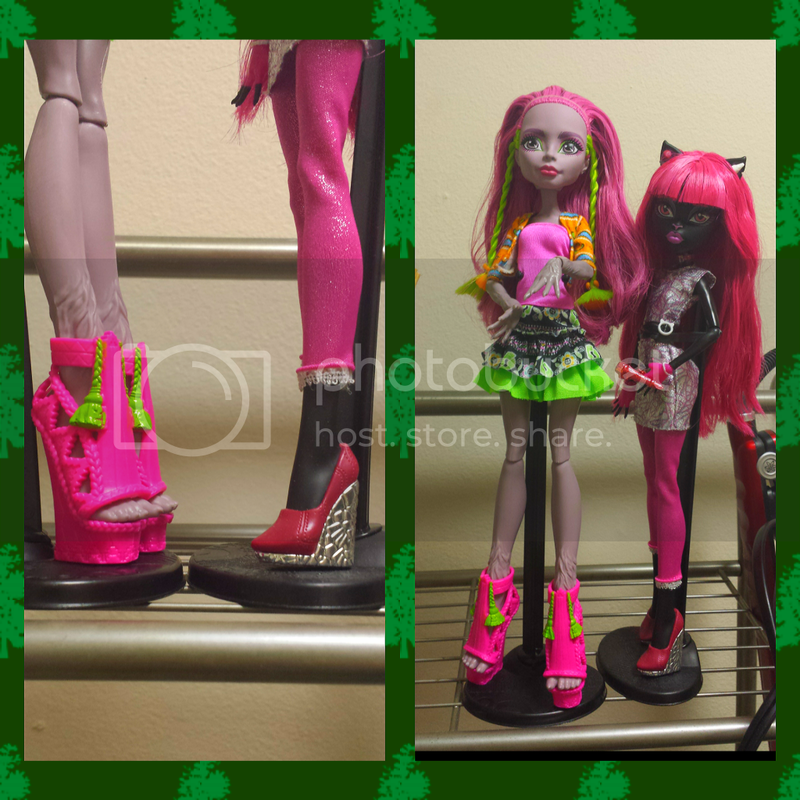 Monster Discussion / Re: 50cm Monster High dolls? I like this idea, but I'm going to have to see them first. If they are like those huge Barbies, it's going to be a no. But idk, sounds like something I might really like! These lines are coming out so fast, gahh! Congratulations! And thanks for all the photos. Yeah, I have to agree, I'm not totally in love with him. These pictures are fantastic though, I've been anxious to see more off him even though he isn't quite my cup of tea. Thank you for the awesome pics, itzelery! Brags / Re: My first boy! BEAUTIFUL Gil! You are so lucky, he is awesome! After a lot of asking around, pleading, and waiting, I finally was able to get an employee at Target to go in the back and get Mari for me! She is exceptional, far better than I could have imagined!! Here she is in comparison to to Catty, without her hat cause I'm just not feeling it. Porter, the son of Slimer. Love it. Bahahaha! I'm going with that head cannon if that's ok, so funny! I have been thinking about going back and getting the FF dolls i still need though . It is sooo tempting! Bummer :/ Good to know though, thank you! BUT I'm all in for Vandala and Kiyomi! Crossing my fingers for pets. I know it's unlikely but if they do come with pets, I well buy them all. I'M ALL ABOUT THE PETS.